These words appear often in my writings. Take time to read over them, and later on while reading you will have a better grasp of the context, meaning and a better chance at understanding what is being said. Enbrightenment may appear complex (through the written language) at first, but by taking your time to understand the verbiage that is being used anyone can learn how to read the stylized writing. Enbrightenment: term coined (and developed specifically for the creation of the tradition) to define a spiritual tradition, a revelation, and Self/God’s Realization, including the sum-total awakening of the anatomy of esoteric/spiritual consciousness within the body/mind. This spiritual tradition was founded by Jared J. Kimble, and Enbrightenment is created as an integral and collaborative, inclusive, spiritual teaching. The word Enbrightenment is a living definition, which means it is not beyond criticism and critique. However, the definition of Enbrightenment is to be respected so that the word keeps its integrity and meaning, while not becoming deluded by over use in society. The word is created as a sacred word, not something that should be used lightly. Spiritual Cross: term coined (and developed specifically to name/label the whole anatomy of bodily consciousness that Awakens through Enbrightenment) and used to define the total anatomical structure of (spiritual) consciousness. This is the conscious bodily form that awakens with the progressive bodily awakening of Enbrightenment, the process of ego death. The Spiritual Cross is the bodily anatomy (appearing within each individual) of the Transcendent Consciousness of God, which Is the anatomical conscious structure through which God consciously lives As the individual, and the Spiritual Cross comes to life (progressively) as the body/mind is capitulated by the Transcendent Consciousness of God. Tower of babblon: term/idea coined (and developed) to ‘point at’ the systematic building onto or taking away from a mental tower of babblon. The ‘tower of babblon’ is the current world-view held by the individual. It is the egoic based, self possessed, consciously dark attempt of the body/mind to create a world-view that somehow enables a person to Know God/Truth/Reality. The (ego) mind babbles on and on to itself in order to hold onto a bodily sensation of separate self. This babbling Is the false sense of self (ego). This babbling of the body/mind forms the individual's world-view, a world-view designed to capture Reality and God in thought. The babbling comes from a deep rooted fear, and that is the fear of death, dying, and non-existence. The individual attaches the feeling/sensation of self to this activity of the body/mind. Furthermore, when this feeling seems like it will stop or end the individual experiences these fears. The ego pretends to ‘worship’ God, seeking forgiveness and repenting for sinning, and wanting to be rewarded for good behavior, and for adhering to the ‘true/right’ church (whatever religion you want, most have a fanatical side that claims a monopoly on God somehow and an Armageddon to back it up). This mental tower is the attempt to gain a monopoly on God, the Revelation of God, and the Communication of God; ALL religions and traditions are ‘towers of babblon’. The ‘tower of babblon’ points at these attempts and claims they are all limited, and not Absolute or Perfect; furthermore, it says that NO religion Ever formed is capable of having a monopoly on God/Truth/Reality. Like the original story of the Tower of Babylon, all attempts are just as silly, just as pointless, and just as much of a waste of time and labor, and sacrifice of community: for nothing, for delusion, and for self created darkness. I even claim Enbrightenment is a ‘tower of babblon’, and It too MUST be Transcended. This does not force those practicing Enbrightenment into a dogma or set of beliefs, and those practicing Enbrightenment are Free of dogma and belief, because in the end God is not of any religion; God Is Perfectly Free of All religions, and this is God’s Eternal and Everlasting Living Steady-State of Existence. Inherent within the Enbrightenment tradition there is the Fullness of the True Teaching of God’s Realization within the context of the human condition, and that requires consciousness to See beyond the ideas of religion, tradition and spirituality, and to Notice the Pristine Everlasting Reality of God. The fundamental Reality with Enbrightenment is that it was knowingly created, and it is not created from the point of view of ego. Enbrightenment was created after the Resurrection, and after this person (Jared J. Kimble) passed through all stages of bodily Realization. It was created through a God Realized ‘point of view’, and not from the seeking ‘point of view’ based on the ego coil. Therefore, built into the ‘tower of Enbrightenment’ is the Teaching of Transcendence and Realizing God beyond All forms of media, beyond All forms of appearances within any conscious experience. Enbrightenment is here to serve, not bind, Enbrightenment is here to catalyze not entrap, and Enbrightenment is here to Commune not isolate/monopolize or enslave; Truly Enbrightenment is here to Initiate the Freedom of the Transcendent God of Reality in All appearances manifesting throughout all Universes. God (within Enbrightenment): term used to ‘point at’ the Only and Ultimate and Perpetually Perfect Everlasting Reality of Existence. It is the substance of all things, the actual appearance of all things (identity), and it (God) is the Only Presence, Reality, World, and/or Universe ever, God Is All simultaneously; there is no other. It has never come into existence, only appearances and forms come and go, the substance (God) is eternal, without a beginning or end; furthermore, any and all appearances are simply modifications of the One and Only Existence (God). Ego (sin): term used to point at the Useless and Unnecessary conscious activity which apparently prevents the body/mind from Living through God Only. Fundamentally, there are no separate selves, you are not a separate self, and truly, no separate self exist anywhere, ever. Essentially ego is, at its root, an inward conscious clinching of the body/mind itself that has no center or core upon which this clinching occurs. It is like the body/mind is trying to refer to its self via this conscious activity. One can think of it as if you are in a primitive state and without spoken language. Next, you experience a moment where you are trying to say 'me' or 'I' to another, and upon that experience you consciously contract across the whole body, from head to toe, in order to say 'me or 'I'. The ego is a reflection of seeking and searching for Identity in the midst of appearing reality (changing reality/appearances). It is a reflection of a search for truth, while simultaneously consciously (initially ignorant) denying the (Truth) Very Immanent and Immediate Everlasting Presence of God. The ego (sin) is a pattern of consciousness, not a real entity or thing with a physical shape or form. Once there is at least a Faith based Realization of God only, the egoic state of consciousness is realized to be a living denial and/or rejection of the Everlasting Transcendent Reality of Existence. This rejection happens moment to moment, and this conscious activity of rejecting (even whole bodily) the Transcendent Self Is the quality of ego. Guru: term used to refer to the Way God Teaches and Communicates ItSelf to ItSelf through ItSelf. The devotee relates to the Guru in all sorts of appearances, and through all sorts of experiences. The (bodily and fleshy appearance of the) Guru does not appear unless there is a Devotee of God. When people turn to Know God, and to Know God Truly and Fully the Guru appears in the Same bodily form. The bodily appearance of the Guru is always a function within the Total Process of God/Self Realization relative to an individual. The Guru must be understood to be a function of God’s Realization and how It is Communicated through the creation, and that function (the Guru) must ultimately be Transcended by Realizing the Guru As one’s Very Own Heart of Consciousness. The Guru may appear as anything, and It (the Guru) Is Perpetually Manifest in the Heart of each individual, but unless One makes the Final Leap into God through Transcending Every possible media of Teaching there will be the need to be in the Living Company of the Guru (the human/fleshy appearance). Realization: term used to identify the steady-state of conscious satisfaction that is discovered within the Transcendent quality of existence. Realization Is what it means to have released and abandoned the egoic contraction. Realization is what is left over after the individual no longer identifies As the inward coil of the feeling of separate self (ego), and the activity and attachment to that clinching of separate self is blown out and annihilated permanently. It is a state of unconditional and undifferentiated consciousness that does not require anything, seek anything, search for anything, and/or want to be something more or less than what It IS already and perpetually right Now. Realization is the living state of consciousness transcendent of (not separate from) appearances, and perpetually manifest As the Most Pristine Everlasting Presence of God. Realization is Immanent right Now. Realization Is the Omni-Present Reality of Reality ItSelf; Perfect and Flawless, beyond all time and space (not separete), beyond all appearances (not separate), and beyond the experience of birth and death. Consciousness: term used to refer to the fundamental Omni-present reality of existence. Consciousness is the existence of communication, not only ‘between’ appearances and forms, but It is the Omni-present media which communicates ItSelf As Existence ItSelf. All communication is born from Consciousness; whether that communication occurs through time and space (including all forms of quanta - data - information) or is transcendent of (not separate from) time and space. This Is How God Communicates ItSelf As/To ItSelf Freely and Perpetually right Now, and this happens without effort, urge, process, progress, change, development, and simply beyond (not separate from) all conditional forms of existence. The body/mind did not come together and form the conditions that seemed to support the appearance of consciousness. Instead, Reality Is Consciousness. Cosnciousness is inherent in the Very fabric of existence ItSelf, and thus, the Source for all possible forms of consciousness. Without consciousness existence would not exist, there would not be a universal observer, a single Consciousness (Presence – Being) perfectly present at all points of time and space and in all directions. The living state of the human is the Perfect Conscious bodily Form for God Realization, and the appearing Universe is Perfectly Grounded in Consciousness for the Free Opportunity of Perpetual and Imminent and Immediate Realization of Self/God/Truth/Reality. Transcend: term used to describe a conscious (inherent) Seeing beyond the conditional (ego bound) appearances of reality, but not necessarily separate, other, or different than conditional appearances. It is a term used to ‘point’ at the conscious dynamic of consciously seeing beyond the current manifestation of appearances the body/mind is experiencing. To transcend (within Enbrightenment) means to notice the steady-state of consciousness that is not changed or effected from or through experience. Transcending something means to not be bound by the current limitations of one’s self created idea of identity. To transcend means to live from the source of eternal consciousness, and to relate in all conscious experiences through the everlasting reality of conscious existence. Transcendent: term used often to ‘point’ at the quality of reality that eternally exists As the Light of consciousness. Inherent within the idea of existence there is a sustaining quality of existence that does not change, mutate, move, appear as something, come into existence nor can Its existence end, neither does It appear in portions, parts, fractions or in any form. The Transcendent nature of existence is discovered through the Awakening of God’s Realization throughout the body/mind. That which Is Transcendent is Always Transcendent (beyond the limitations) of All appearances in the past, right now, and all possible future appearances. Transfiguration: term used to refer to the Actual process of Awakening the Whole Spiritual Cross. The process takes place within the human condition, and all forms of bodily consciousness are ‘changed’ to support the Divine Activity of God’s Transcendent Consciousness Only. The Transfiguration is also a sub-stage of the Resurrection stage, and the term is used to refer to one of the major processes after Resurrection. The bodily transfiguration appearing through the Spiritual Cross realigns the Whole Spiritual Cross with the right-heart. This process is discussed in ‘The Ocean’, and ‘Fires of Transfiguration’. Translation: term used to refer to the final process after Resurrection and the sub-stage of Transfiguration. Translation refers to the process of the Spiritual Cross working on a Cosmic scale of transforming the local environment, and/or the sum-total of the Universe at large. The individual in the final stage of the Resurrection stage will notice the living dynamic of the Spiritual Cross working throughout the Cosmos, and this process Translates the body/mind (including the whole Spiritual Cross) to function Perfectly and Freely within the context of any appearance of conscious experience. This sub-stage Transforms the body/mind and the Universe As One Form/Body. This process is also discussed in ‘The Ocean’ and ‘Fires of Transfiguration’. The Resurrection Testament v. 1-4: these are the source text/scripture for Enbrightenment and the Spiritual Cross. Resurrection: term used to describe the ascending current that spawns from the right-heart of the Spiritual Cross. It means that all egoic states of consciousness are no longer active and existing within the God Realized (Enbrightened) individual, and in the process of Enbrightenment the Resurrection (ascending of the Resurrection Current from the right-heart) marks the final and ultimate stage of bodily transfiguration. It is the living steady-state of perfect bodily communion in God. clouds: term to describe the first initial stage of Enbrightenment. This stage is the stage of self inquiry, self doubt, self wonder, self ‘what-if’, and self uncertainty. This is the stage before Real Genuine Spiritual Life Awakens. There is no Real (there is not even at minimal/least a faith based Acknowledgment of Self/God) Self Realization in this stage. A person can attach to all sorts of ideologies in this stage. They can be a theist or an atheist, and neither Are Self Realized. All forms of religion, philosophy and tradition have historically been created from the ego ‘point of view’, from the conscious relationship that is lived in during the stage of the clouds. This is why historically dogma and belief have been the Pen-Ultimate teachings of practical and conventional religion, which is all created from the egoic relationship of the body/mind with God. Stage one: this is the stage where Self Realization Dawns. This is the stage when the individual begins to consciously notice the Transcendent One, it is the stage where the individual takes the Faithful Leap of Self/God Realization and Notices, Acknowledges, and Identifies As the Everlasting Consciousness of Reality. The body/mind begins to notice, recognize, abandon, and transcend the conscious clinching feeling of separate self (ego). Self Realization is there and present even though the ego coil of inwardness is still appearing and reappearing, but now in stage one the individual has began to forget the ego because Realization ItSelf Is Now more 'attractive' and 'appealing' than separate self. The body/mind is surrendering and dissolving consciously into that which Consciously Transcends (not separate from) it. This is the stage where the devotee of God learns to Identify Solely As the Transcendent Reality of our Eternal Existence as the body itself. This is the stage where the left-heart of the Spiritual Cross begins to manifest, and the main signs are subtle experiences of bliss, light and fire happening in the left-heart location of the Spiritual Cross. However, the awakening of the left-heart may come after the center-heart awakening. It really depends on the individual's disposition and their unique (personal) processes of ego death that awakens one or the other first. The central, egoic dissolving, process appearing in stage one primarily relates to a bodily point of view and Transcending that point of view. However, until the left heart is realized and holds a steady awakening one is not ready to progress into stage two. Stage one is the first stage where the Divine Truly begins to take Root As the fundamental Source of all bodily conscious. Stage two: this is the stage where both the left-heart and the center-heart demonstrate a strong tangible presence. Stage two is the stage when the Heart~Fire is awakened as the steady-state of the body/mind’s consciousness. The primary ego Transcending processes are associated with the mind, and Transcending all 'points of view'. With the growth into stage two the dynamic of transcending the bodily point of view moves into the more subtle, less tangible forms of the egoic contraction. These forms are deeper in the consciousness of the body/mind than general bodily experience of consciousness. The ability of the individual at this point to Witness the conscious dynamic of the coil of separate self has become profound. The relationship with the Guru in stage two develops along the lines of surrendering the beginner's practices for the Ultimate Enbrightenment Way. That Way is Heart Communion with the Guru. The processes in this stage appear in and around the center-heart’s awakening and finally the right-heart. This is the stage in which the vertical line of the Spiritual Cross begins to demonstrate strong dynamics of ego transcending along the different centers of esoteric consciousness. There may be the conscious experience of the ascending flow of consciousness, sometimes like a (hot or cold) plasma around the ‘outside’ of the spine, and/or directly within the spine (which happens later in the second stage). The growth into the steady-stable and perpetually Awake living State of Heart~Fire appears within stage two. At the end of stage two the right-heart becomes the focus of God’s Grace-filled meditation As you. The dynamics associated with the end of stage two are concerned with the descending dynamic into the right-heart from the crown star above. The final coils of egoic consciousness (the most subtle and ultimately root form of ego) are engaged, catalyzed, and transcended through this dynamic of consciousness. The last Sign of stage two is a progressive Heart-Felt bodily Communion with the Guru, and that Heart-Felt Communion becomes the Seat where All Teaching takes place. 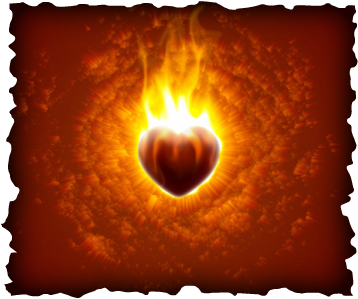 The Heart~Fire Communion ItSelf Is the Teaching, and that is clearly recognized at the end of stage two. The end of stage two Confirms the Reality of Three Hearts, it Confirms the current which is present between the right-heart and the crown-star, and It confirms and demonstrates the Living Dynamic and Communion of the Relationship of the Devotee (of God) and the Guru. The Only Way bodily consciousness enters the Resurrection Stage is through Ultimate Transcendence of All possible Gurus, and traditions, and religions, and ultimately the perfect death of the ego coil of separate self. Stage three (Resurrection stage): this is the final stage of Enbrightenment. It is the stage of the Living Resurrection of God Only. It is called a Resurrection because with the (perpetually) consciously manifest Eternal Release of the egoic coil of inwardness, which is the True Death of ego, God’s Realization Resurrects As the Living Being of the individual. God Is the Only Consciousness Appearing after the total Death of the activity of the separate-self (ego – the sinner). The coil of conscious inwardness is Released through (into) the right-heart and the Resurrection Current subsequently manifests from the Seat of the right-heart. There are two main sub-stages after the Resurrection. The first (transfiguration) concerns the process of re-aligning the entire manifestation of the Spiritual Cross with the Conscious Source of God’s Realization in the right-heart. The second (translation) appears after the completion of the bodily alignment with the right-heart. The second sub-stage is concerned with cosmic processes that align the body/mind and the Universe As a whole. Stage three (Resurrection stage) is the final-everlasting stage of Self/God Realization. The Resurrection stage never ends, It Is the True Life God Intends for All, thus, the Resurrection stage is the True Stage of Life in Its Fullest, Most Transparent, Totally Free, Never Bound, Absolute Blissful, and Perfect Happiness of Everlasting Existence. The Resurrection stage IS Eternal Life.